I was struck by this article by Rob Johnson, printed in yesterday’s Wall Street Journal . Headlined “Point. Set. Match. 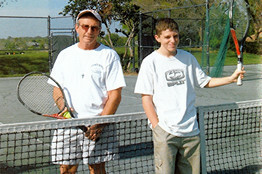 I Lose.”, the story concerned how Johnson, an avid amateur tennis player in Orlando, Florida, became disillusioned with his career as a journalist and decided to gain certification as a tennis teaching pro, then work at various resorts in the Orlando area. It was a business model where he would be his own boss, doing what he loved, wearing comfortable clothes and working with carefree tourists rather than cranky editors. Not to mention the fact that his overhead would be low, and he would keep the majority of what hotels would charge guests for lesson fees. But the reality turned out to be different from Johnson’s expectations, and he ended up working with clients who wanted tips on local restaurants and shopping as much as they wanted to improve their tennis games. Or with kids who wished they could have spent another day at Disney World instead of on the tennis court. His adventures in entrepreneurialism ended in a pile of unused “Coach Rob’s EZ Tennis Academy” T-shirts that now lie in his basement. And for Rob, at least, teaching tennis took the joy out of playing tennis. So Johnson returned to working as a journalist and playing tennis for fun. But I appreciate his honesty in sharing the experience of trying to blend his passion for a sport with his career. It provides helpful input in thinking about what I might want to do. It may at first seem like you’ve failed if you realize you’ve bumped up against your limits. But just like when you have to draw the line with your kids, and they hate it but secretly appreciate knowing what your rules are, it’s actually helpful to discern your personal boundaries. Last week I attended a thought-provoking conference for alumnae of Stanford’s Graduate School of Business. One of the speakers, renowned entrepreneur and investor Heidi Roizen, cautioned attendees about the “flip side” of accepting venture capital: while it’s great to receive significant financial backing for your entrepreneurial concept, VC funding comes with high expectations for return on investment. While she conceded that not everyone at the GSB finds her views popular, she said that for many entrepreneurs, the choice to maintain a “lifestyle business,” where one makes a good living but chooses not to “go big or go home,” can be a perfectly acceptable decision. When you live in Silicon Valley, where Facebook just went public for a record-setting $104 billion, it’s counter-cultural to state the view that one can be happy with a job providing merely adequate income for one’s needs and wants. While Johnson and Roizen come at their messages from different backgrounds and most likely different economic profiles, the core of what they say is similar: maximize career happiness by doing something you enjoy, but don’t get fooled into thinking you would enjoy working at something that’s better left to others. Respect your limits, and you’ll be happier. Does losing a lot make me a loser? So I lost another tennis match last weekend. This is nothing new, really. As my high school son remarked on Skype to his college siblings, “Yeah, Mom likes tennis, she plays a lot. Most of the time she loses.” Which pretty much sums up the past few months on the tennis court for me. And it’s getting annoying, because I think I’m actually playing better than I did before – I’m just not winning, that’s all. For a while last summer, after one of the worst USTA (United States Tennis Association) seasons of my life, I thought about giving up tennis. Turning my energies to something where I had a chance to improve. But to what? Not yoga – a teacher once stood beside me and loudly suggested that “some students” could benefit from private lessons before coming to group classes. And this was after I had been doing yoga for a year. Certainly not golf — don’t even go there. Handicrafts? No, thanks. Cooking? Although I enjoy it, I don’t see myself cooking more than I do now: I’m not going to teach classes or write cookbooks, blog about food, and so on. My husband doesn’t want the next Barefoot Contessa anyway — at least he doesn’t want a wife of that size (now Giada de Laurentis, that might be another story). So I figured I might as well keep playing tennis, since I like the sport, enjoy getting exercise outdoors — plus I like the clothes, the social aspect and organizing teams. Even though I’d been starting to think of myself as a loser, not merely as someone who loses more than she wins, I told myself this attitude had to change. That the self-criticism had to stop. If I couldn’t play and have fun, there was no point in playing. So for a couple of months I avoided playing tennis in leagues at my club, because they felt too evaluative. I played random people for fun, and I didn’t think much about the results. Tennis almost became a recreational activity again. But I missed the organized matches. So this fall I went back to league tennis. I resolved to stop judging myself and just play. To stop talking so much and watch the ball more. Hard to do — at least hard for me. I’m starting to see some improvement, however – but it’s not yet reversed my losing record. Why are mental issues the toughest? I just lost a tennis match. A USTA match. One I should have won. It started out well enough: my partner and I won the toss, served and won the first game. Next we lost our opponents’ serve, no big deal. Then they broke our serve — this was kind of a problem, since their better server served next, and we couldn’t break back. Now the score was 1-3 against us. Our opponents made a couple of questionable line calls, which we let go rather than argue, but I resented the behavior nonetheless. They also had an annoying habit of whacking the ball back to the server any time a first serve was out, disrupting the server’s rhythm and focus. Before we knew it, the first set was over, 6-2. My partner and I tried to regroup. Our opponents weren’t better players than we were, we knew that. So we resolved to sharpen our focus, watch the ball, etc. We won the first two games easily. They called my partner’s shot out on an important point, when I clearly saw the ball land in the alley. I questioned the call, but not surprisingly, our opponents were “absolutely positive” they had seen the ball land wide. I was so irritated with them at that point that I double-faulted the first point of my serve, and proceeded to lose the entire game. I told myself to get a grip, breath, calm down. We went up 40-15 in the next game with a volley I hit at the feet of the gal who had been calling our balls “out.” She popped the ball up and over the fence, into some bushes nearby. She immediately directed her husband, who was sitting on the sidelines with a beer, to go and find it. He started rustling in the bushes beside us, and we lost the next point, 40-30. The husband handed over an ancient, dirt-caked ball. “No, that’s not it,” she said. My partner asked if we could please just finish this game and then deal with the ball situation. “Sure, no problem,” our opponent said. But her husband returned to the shrubbery. As he continued to shake the bushes, the other side won three points in a row to take the game. No question about it, I was letting my emotions get the best of me. I was also sure my partner was thinking it was my fault we were losing this match, that she’d never want to play with me again. My internal voice of judgment was drowning out the simple “bounce-hit,” “watch the ball” mantra I would repeat to stay calm. I just wanted to get out of here. That happened soon enough: we lost 6-2, 6-3. As you may have guessed, the foregoing was not an actual match, but an amalgam of USTA matches I have lost. While higher-level tennis may not be disrupted by balls in the bushes or arguments over line calls, nearly every player loses to a “lesser” opponent at least occasionally. We saw two such matches last week, as Kim Clijsters and Caroline Wozniacki, world-ranked #2 and #1, both lost early-round matches to players ranked below them during the French Open. AT&T Park, at the edge of San Francisco Bay, floated with celebrations last weekend. The San Francisco Giants’ 2011 home opener on Friday saw our “Fear the Beard” closer (Brian Wilson) run the 2010 World Series flag out to the right field arcade and hoist it up the flagpole to rest just below the Stars and Stripes. Saturday night fans arrived an hour before game time to witness the historic presentation of the World Series Championship rings – enormous, gaudy things that went to every player on last year’s team, plus the front office folks and untold others in the Giants organization. The first ring was presented to 53-year Giants veteran Mike Murphy, who manages the Giant’s Clubhouse. Not to be left out were Giant fans’ favorite radio voices, Kruk & Kuip (Mike Krukow and Duane Kuiper). Also receiving rings were the team’s six living Hall of Famers, four of whom attended the festivities. Non-players donned tuxedos or even tails (with orange bow ties, of course), lending an air of class to the occasion. Many players put on their rings immediately. They lined up along the first and third base lines, with each new individual receiving his ring making his way down the ever-longer row of players to fist-pump or bear-hug on the way to his spot. Sunday marked the 2010 Rookie of the Year presentation to catcher Buster Posey, who characteristically deflected praise in thanks to his teammates, the selection committee, everyone in the Giants’ organization, and of course, Giant fans. He was joined by four other past Giants who received Rookie of the Year awards, and he was given a day off catching to revel in the moment. Monday the Dodgers were in town, and Juan Uribe (last year’s SF shortstop, now a Dodger) received his ring before the game began. The upshot: fabulous ceremonies, once-in-a lifetime experiences, all pulled off in true San Francisco style: celebratory and sophisticated. On the diamond, the first four home games amounted to two come-from-behind wins, followed by two losses. Sports commentators agree that it’s time to set 2010 aside and turn our attention to 2011.